I’m still in a quandary over what to do with my living room windows. I simply cannot find a fabric that I can get excited about — one that I love AND that’s in my budget. So, as several of you suggested, I’m really considering stenciling my own fabric to create a pattern that I like in just the right colors. Painting curtains is something that I never thought twice about in the condo. I painted the curtains to hide the washer and dryer in the hallway, and then just last week I painted some curtains to go in the bedroom. But those were cheap and easy ideas for a condo that has a much more lighthearted look and feel to it than my house. The idea of putting painted fabric draperies in my house, where I’m trying to focus on higher quality items (still on a budget), just never occurred to me. But the other night, I started searching Pinterest and Google for some painted/stenciled curtain inspiration, and I realized that so many of these don’t have that “painted curtain” look at all! They look just like printed fabric…and quite expensive fabric at that. So I’m really giving it some serious thought. At this point I’m about 80% sure that I’ll end up with stenciled draperies in my living room. Here are a few examples that really won me over. These were done using an allover damask stencil from Cutting Edge Stencils. I never would have guessed just from looking at them that they’re stenciled. This is one of my favorites simply because I love, love, love a good trellis design. This was done using the Trellis stencil from Cutting Edge Stencils. And then these were done using a different type of trellis design. This is the Tea House Trellis stencil from Cutting Edge Stencils. This one shows what a difference it can make just using different colors. I’m pretty sure this is the same Allover Trellis from Cutting Edge Stencils that was used on the one above (two photos above — the white and gray), but I really love these softer colors. At a glance, that looks very similar to Kelly Wearstler’s Imperial Trellis fabric from Schumacher that retails for just under $200 per yard. Of course, there are more stencil companies out there other than Cutting Edge Stencils. That company just really loves to work with bloggers, so if you read blogs regularly, you’ll see their stencils used quite a bit. 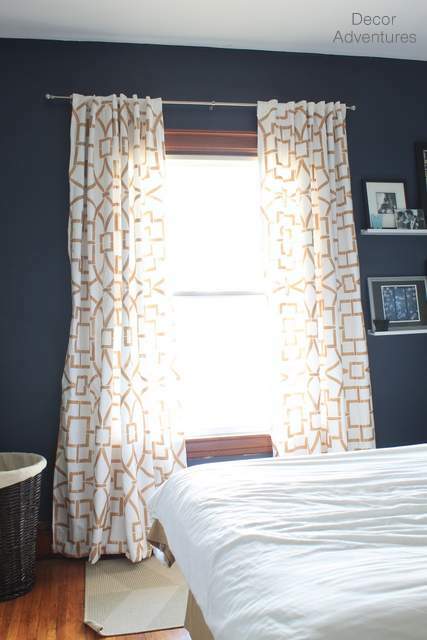 But here are some curtains that were stenciled using an Ikat stencil from Olive Leaf Stencils. I really love the wide band of solid fabric at the bottom. That gives them a much more custom look to me. You can also make your own stencil if you don’t want to purchase one. 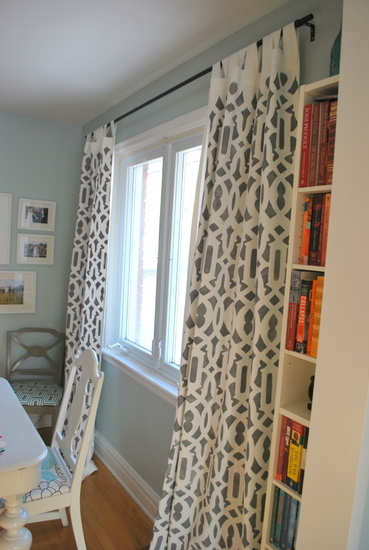 These curtains were done using a small DIY stencil. These were also done using a home made stencil cut out with an X-acto knife. And then there’s my favorite option (just because I generally like striped designs)…good ole painters tape. This design, which was much more labor intensive than my go-to quick and easy stripes, was created with painters tape. So this is definitely the direction I’m leaning for my living room. I think I’ll purchase some really cheap fabric and come up with three or four design and color combos to test out. If they look promising, I’ll share them with y’all and you can give me your thoughts! Would the stencil you are using on your breakfast nook wall work? It might be fun to repeat that pattern. It is so much fun to watch your projects come together. That is the stencil I’m considering, but if I use it on the draperies, I won’t use it on my breakfast room walls. That might be a little too much repetition for my taste. 🙂 I might, however, just use it on the fireplace (i.e., the area above the fireplace) or something like that in the breakfast room. 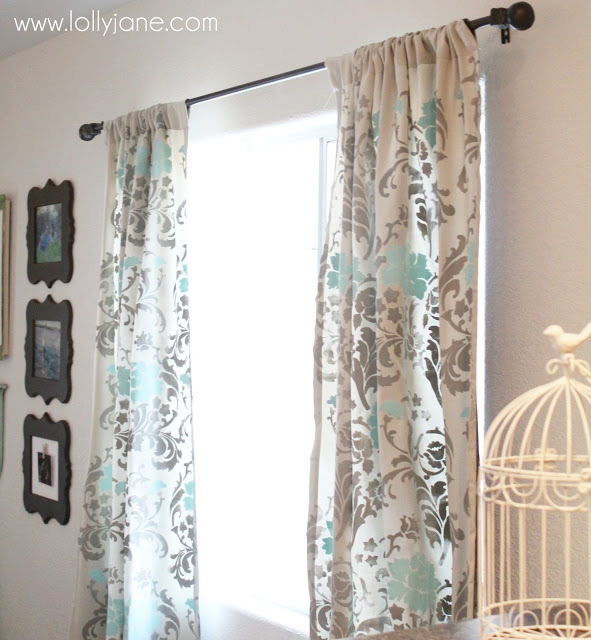 Stenciling your own curtains is a good way to go. From the examples you showed, you can achieve a wide variety of looks. 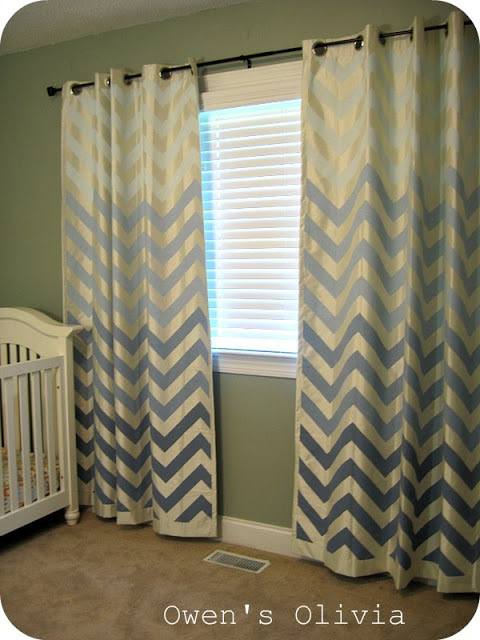 My favs are the Ikat & the curtains from Owen’s Olivia – the fabric in the last one really sets them off! I was laughing for exactly the same reason – so many fabrics witha “stenciled look” that’s weren’t actually stenciled, yet you wish to make a stenciled fabric that looks printed -” ironic” doesn’t even begin to describe it! Too funny! I had to smile , there are so many fabrics out there with the “stenciled look” yet we want to create a stenciled fabric that looks printed haha just found that so ironic. I can’t wait to see what you come up with though . Bet it will be stunning. Love this idea and have been toying with it for a while now for our shower curtain. I have purchased canvas drop cloths from Lowe’s. I am afraid to try other fabrics (bleeding, etc.). Can’t wait to see your results. 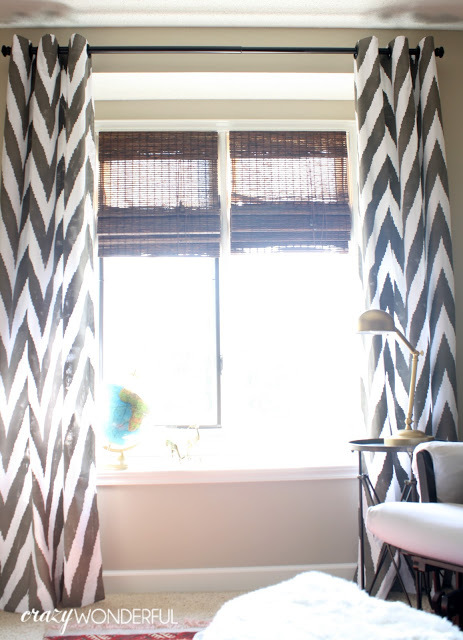 The ikat curtains are my favorite! Tres chic!!! Hand stenciled drapery for your home would be exquisite. I still like the idea of plain panels with a stenciled design on the leading edge, under a cornice with the same design along the bottom. 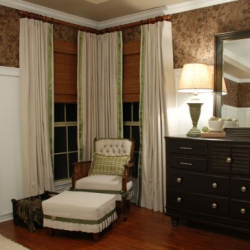 If you do an allover stencil for the drapery, won’t they become the focal point in the room? I don’t really like that particular green or turquoise, but I think the same concept using my teal and green would be amazing…and I’d be returning to my love of lots of color. For some reason, I’ve kind of steered away from that, or tried to tone it down in the house, but maybe I shouldn’t! I just don’t know. I love those options! If you don’t want it to look stenciled, however, I would paint all the way to the raw edges of the fabric and then hem. Do you see how there’s white space around the border of the curtains in the last picture? That screams “stenciled!” IMO. Not a bad look, but not the look it seems like you’re going for. So I’d stencil first, hem second: exactly like pre-printed fabric. Yes, I definitely see what you mean. I’d stencil,and then sew to avoid the unstenciled white borders. I like the grey and white trellis best of the ones you listed on this post. But I also like the bordered ones on your previous post. To me, these stenciled ones just don’t quite measure up to the elegance of the others. Maybe it’s because they are curtains and not drapes. I’m sure you’ll figure our something that’s just fabulous. I don’t know….I think a project like this kind of devalues your time. Yes, it is fun and amazing and creative to do the DIY stuff, but I don’t think you have to do everything. This looks and feels to me to be very time consuming, not to mention back breaking work. There must be be something out there that will make you happy that doesn’t cost $200. a yard. Start looking a simple ready made drapes or curtains and maybe you can embellish them with your own style. I bought plain line panels from overstock last year, because I wanted something to frame the French doors in the kitchen/lounge area. When I hung them they just looked so boring. I went through my fabric stash and found some fabric that I love. I added about 18 inches of it to the bottoms of the panels, attaching right to the panels, since they were the right length. They look so much better, more expensive and very custom. They are hung from a black pole rod with rings. It did not take much time at all, actually did it while watching TV at night. Maybe you can find something inexpensive and plain in a faux silk, since you are going with such rich colors and fabric on your sofa. You could then embellish them with a stencil or a fabric that is costly but could be used sparingly. I just think about you on your hands and knees stencliling all those panels and the hours that it will take. Your time is more valuable than that, even if you just spend it writing.Blessings. I enjoy following your blog very much. You certainly are talented! This is a good site for window treatments at affordable prices: http://www.countrycurtains.com/category/100+curtains/101+see+all+new+arrivals.do. Another way to go might be with block printing but if you are set on a trellis design, maybe not. On another note, thank you for the post on the Velvet fabric from OnlineFabric.net. I have been searching for the right, but affordable velvet to reupholster a chair. I got samples from Calico but all the colors were meh. The samples from OnlineFabric make my heart sing. Now I am ready to get started! Thanks for sharing. You seem to be headed into a more elegant and formal feeling in your living room. I’m not sure about your area, but here in NJ, décor fabrics often go on sale in January. If you keep looking, you may find just the fabric you want. I know the allure of wanting a project finished, but sometimes taking a breath or two or three works to our advantage. Whatever you choose, I’m certain that I’ll be impressed. Happy Thanksgiving. Just remember to keep it dramatic. 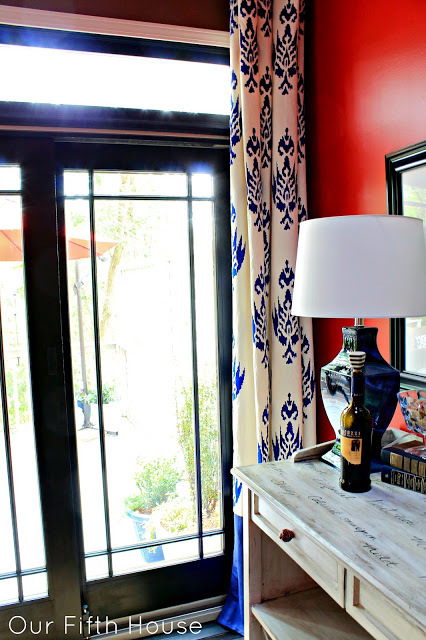 You don’t want curtains that are drab in color, but vibrant. I would love to see as much drama in your living room as you have going on in the kitchen and breakfast room. I still think that there is a fabric out there for you. Keep looking. Although I like the ones you did for the condo I really think that your living room deserves a beautiful fabric treatment. 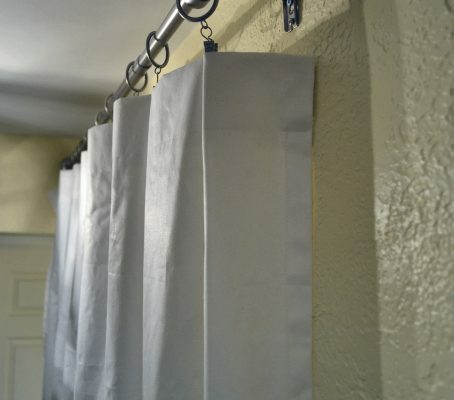 The stenciled and painted drapes just don’t look elegant enough….. Instead of painting fabric, check out Spoonflower.com. They will take any design you come up with and print it on fabric to give you the custom look you are looking for. The pricing is very reasonable and it would give you a much more high-end look and be a lot less labor intensive. Ooo, I like that idea!! My daughter used Spoonflower to create a Dr. Who themed toile fabric to make a dress for the holidays last year — I was quite impressed with the quality of the printing, fabric and the different fabric options available. And they were reasonably priced! I am at a loss why you want to replace your current living room drapes – They are gorgeous – and you made them yourself. I just don’t like the fabric as draperies. The reason I love that fabric is because of the big teal flowers, but those get completely lost in the folds of the drapery panels. I hate that. I’d rather find another application for that fabric where the big teal flowers can actually be seen in all their glory. Maybe I will be the black sheep saying this, but I really think that the quality and longevity of painted drapes will not withstand the test of time. 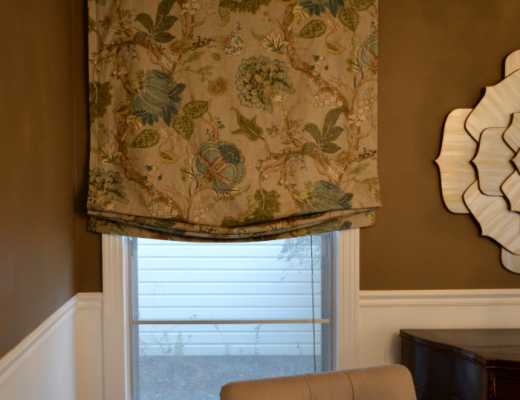 I really loved the cornice idea, And if you don’t want to go the DIY route I am certain there are many consumers who would love to hear about your experience with custom draperies or blinds or shades. Have you considered teaming up with a company on this? I’m a big fan of Smith and Noble, this pin made me think of your cornices and orginial shades on your two smaller living room windows. try http://www.iluvfabrix.com, I have had great luck with them. I’m thinking of painting/stenciling the Roman shades I just purchased for my living room. The shades are a cotton/poly blend. They’re ecru in color. They are lined, and the lining is white (important as I rent this house, and Mr. Landlord wants to ensure all windows show white from the outside). Must I use a special paint, or prepare the shades for painting a certain way, to ensure whatever I use to paint them doesn’t bleed through the lining to the other side? If that isn’t an issue, should/can I use latex wall paint mixed with fabric medium to paint them? It’s hard to comment on the possibility of bleed thorugh without seeing/feeling the fabric. If it’s thin like silk, I wouldn’t chance it. If it’s thick like canvas,then go for it. If it’s in between, then you’ll just need to make the determination. If it’s lined with blackout lining, then you shouldn’t have a problem at all. Any other non-blackout lining…I’m just not sure. It is best to mix the paint with textile medium. If you’re going to buy a paint like Behr, I personally think it’s best to get one that’s 100% acrylic instead of latex. I know that the regular Behr (Behr Premium Plus…NOT the Behr Ultra) in both flat and eggshell are 100% acrylic. There may be others, but I’m not sure. Whatever pattern / design you come up with, you could have printed on fabric at Spoonflower. I really think you shouldn’t stop looking for a gorgeous fabric. I do like stenciled curtains, but as your instinct told you, it’s not for your living room. There are beautiful fabrics, you just haven’t stumbled on the right one. I know that feeling. But if you wait, it will come. Finish some other aspects of the room while you look…don’t rush. And as someone above mentioned, all else fails, draw the design and have Spoonflower print it. But no paint. Not for this room. Love the Ikat with the solid bottom and the all over Damask is gorgeous! I have a question. Up here in New England we have the base ray heaters that sit 10-12 inches high off the floor and against the wall. To put curtains all the way to the floor over the heaters would just direct the heat inside the curtains and warm my windows. Is the only solution to make them to the top of the heater? I love the to-the-floor look, but don’t see a solution. I honestly don’t know of any other solution other than making them shorter so that they clear the heaters. Which is a huge bummer, because I personally don’t like that look at all. I like them all the way to the floor. If I were in that situation, I think I’d be tempted to just leave curtains off completely,and use Roman shades in an awesome fabric on all of the windows instead. Have you checked Pier 1, they have some beautiful Drapes, all nicely lined. I just have to say seeing you use the word drapes.Not many do and I find it amusing going in to look at Drapes (anywhere) that some of the younger associates have no idea what I am talking about! Older associates know exactly what I mean! I normally hear Oh! She means curtains, No, I mean Drapes, there is a difference. Ahhh, yes. The great curtain vs. draperies debate. 🙂 I was reading an interview with some interior designer in the last few months, and he said he only ever uses the word “curtains” and hates the word “drapes” or “draperies”. I couldn’t disagree with him more. I definitely make a distinction between curtains and draperies, and I like draperies for my home. I can’t think of any room in my home where I’d be pleased with curtains. 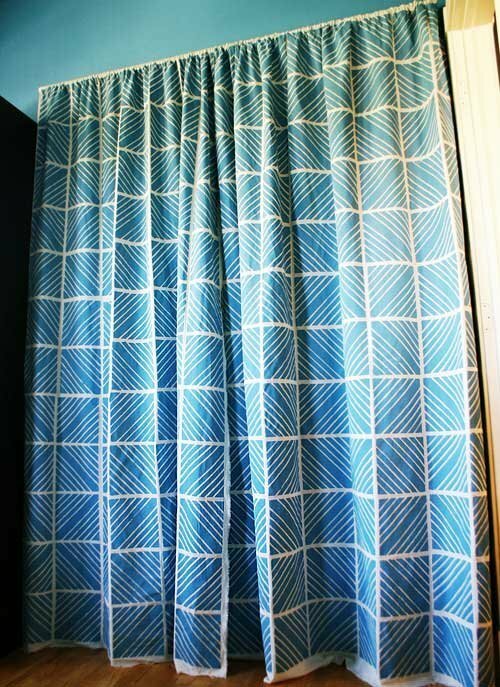 To me,the word “curtain” references something made out of a single layer of fabric, hemmed around the edges, and hung with clip rings, grommets in the top, or tabs at the top…all three of which I don’t really like at all, but tab top curtains kind of make me cringe. Draperies, on the other hand, are lined, possibly interlined depending on the fabric, and include the appropriate hems (4 inches at the bottom, blind hem stitches, etc. ), and actual crinoline inserted in the header with pinch pleats or another quality header design, and they’re never hung with clip rings, but only with real, actual drapery pins and drapery rings. Oh Good!!! I’ve been considering doing this myself, and no doubt you’ll figure out the best way to do it! :-)! Because you’re a genius like that. Paint your own drapes? While the ones you made for the condo look great, and I would consider making them for a specific area in my home, I can’t imagine them with your planned teal velvet sofa. 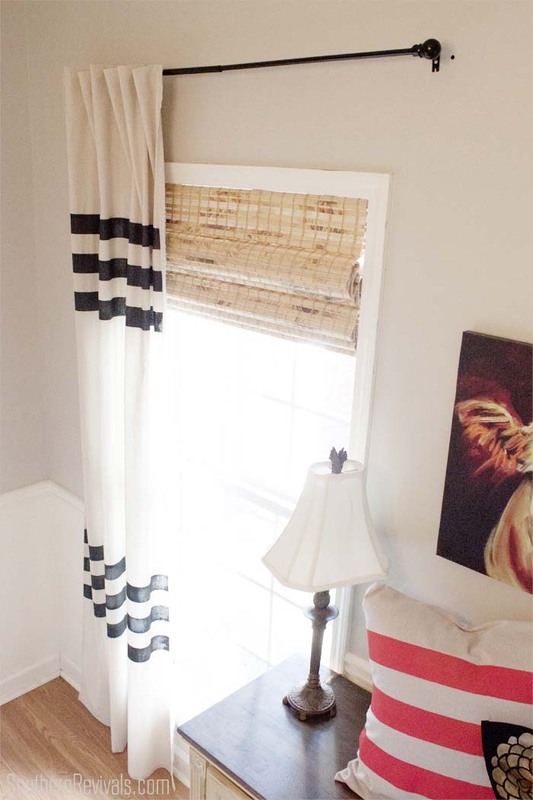 Do your existing drapes not work at all? My thoughts also, with the velvet couch you need fancy drapes. Just my idea, but wanted to let you know since you like outside input. Anything I put in my house would be quite different from what I put in the condo…painted or not. What I put in the condo were cheap curtains…just a thin layer of fabric with some paint and small hems at the top and bottom. What I’ll put in my house, even if it’s painted, will be draperies, made like a drapery workroom makes them, with 4-inch hems, blind hem stitches, fully lined, pinch pleated, hung with actual drapery pins and drapery rings (not clip rings), etc. The reason I don’t like my current draperies is because the whole reason I loved that fabric is those huge, gorgeous teal flowers. But unfortunately, the flowers get completely lost in the folds of the drapery panels. I’d rather use that fabric in a way where it will be flat, and the big, gorgeous teal flowers can actually be completely seen. Kristi, I know whatever you decide to do, it will be amazing–and if you love it, I’m sure I will too. I can hardly wait to read A2D in the morning and also read every single comment and reply (for the past year or more), and knowing the perfectionist that you are, I doubted you could be happy with less than perfect results. Another concern I had but neglected to mention was how the fabric would drape after painted, especially with pinch pleated headers. Paint would add considerable weight to the product. 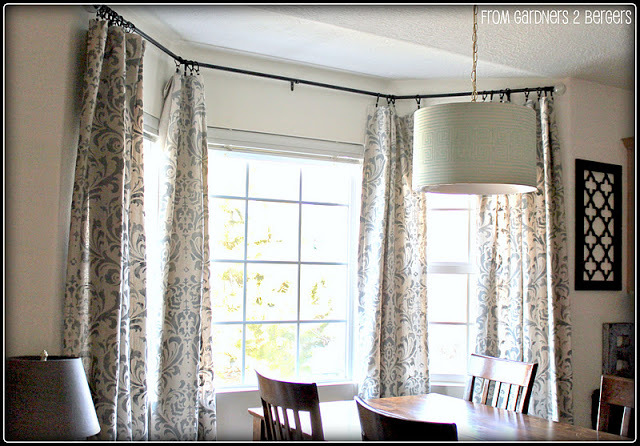 painting drapes,you amaze me every day…..
Count me in with the posters who have suggested Spoonflower if you’re really intent on designing your own patterned curtains. They have a range of fabric weights to choose from. It seems to me that you could get a more sophisticated design and colour scheme from going that route – and it’s more in keeping with the upscale look you want for your living room. 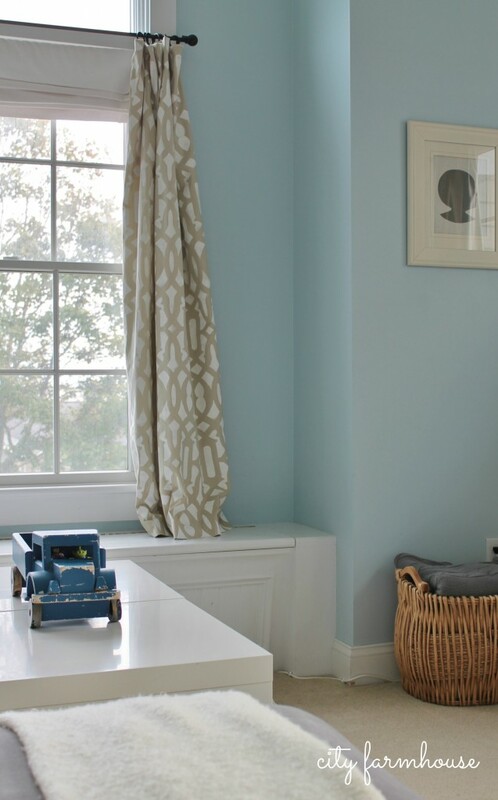 Stencilling your curtains seems at odds with that – in the same way that ship lap or shake walls were with the direction you wanted to take your breakfast room in. Personally, I don’t know if I would be in such a hurry to nail down your curtain choices in the living room..you haven’t mentioned your ideas for the two upholstered chairs your are replacing or what you envision new rug to look like. Those items present opportunity for more pattern and colour – and if so, you might want to consider a solid curtain to provide a visual rest. Right now the patterns you are leaning towards for your curtains are pretty aggressive. I really love the curtains in the first picture! I think whatever you do will come out beautifully with your attention to detail, however, I have to side with those suggesting to possibly use spoonflower. I, too, think stenciled might not be up to par with everything you are doing in this house, at least not in the common areas. While I LOVE that Ikat pair in you examples, count me in with the readers who think you might be jumping the gun on picking and/or making drapes just yet. Unless you already know exactly what you’re doing with all the trim, upholstery for the chairs, rug, etc. I did just that in my dining area, and while I still loved the drapes I had chosen, when all was said and done I had to choose different ones, since they were beautiful BUT too “blah” once everything else was in place. Ended up with an entirely different look and colour after all that angst and expense. I’d wait. These comments and your own efforts demonstrate you can find, make or order anything for drapes, when the time comes. I just saw a Black Friday ad on FB featuring curtains I think you will like. Cannot post link from my iPad, but the site is Zulily.com. Hi Kristi! I too, am looking for drapery fabric. I’m wanting to keep it light and airy and I stumbled across this fabric that I just had to share with you! http://www.onlinefabricstore.net/use-decor/category-designer/brand-portfolio/type-fabric/portfolio-anisha-linen-fabric-.htm It doesn’t look like much at first glance, but when you look at the additional photos….oh my! It’s out of my price range but maybe it fits into yours. 🙂 Anyway, it’s such a beautiful understated fabric but I believe it would make an impact just in the reflections it would create and I wanted to share it with you. Whatever you decide to do I’m sure I’ll love it because I love everything you do! Happy Curtain Hunting! Happy Thanksgiving! Good luck with this window covering decision– such a first world problem. I’m sure it will look good. I’m pretty sure interior decorating in general is a “first world” issue, right? 🙂 I hope you weren’t expecting a discussion on third world poverty or the spread of AIDS in Africa on a blog called Addicted 2 Decorating. Those all look great! I can not even tell that they are painted. Thanks for the great idea! This is exactly what my dining room curtains need. I would hope that you reconsider this idea.